Hyundai and Royal Enfield are both banking on resurrecting important vehicles for their respective brands. These two stories are at the heart of the November 2018 issue of OVERDRIVE, which is on news stands near you. But that is definitely not all. Read on to find out what you can see in this issue. The big story is, of course, the rebirth of the Hyundai Santro. The model means enough for the company as well as its users that Hyundai India resurrected it 20 years after it first debuted in the country. We not only talk about its launch but also drive the hatchback to see how the latest iteration of this star from the past performs in the present-day scenario. Royal Enfield has also just let us get our hands on the Royal Enfield Interceptor 650 and the Royal Enfield Continental GT 650 motorcycles. Editor Shubhabrata Marmar takes both for a spin in sunny California right before the motorcycles are launched in India. See what he thinks of the 650cc parallel-twin engined twins. This month we also write a barrage of reviews for various SUVs. The Nissan Kicks for starters. The big two, however, are the Lamborghini Urus as well as the Porsche Cayenne Turbo, followed by the new BMW X5 and the Range Rover Sport. We also drive the two Datsun offerings, GO and GO+, and the new compact sedan from Ford, the Aspire this month. 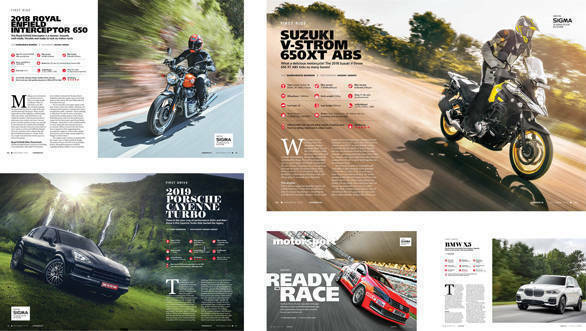 Over in two wheels, we test the Suzuki V-Strom 650 XT, a possible king of the middleweight Adv hill, as well as the new Kawasaki Ninja 300. 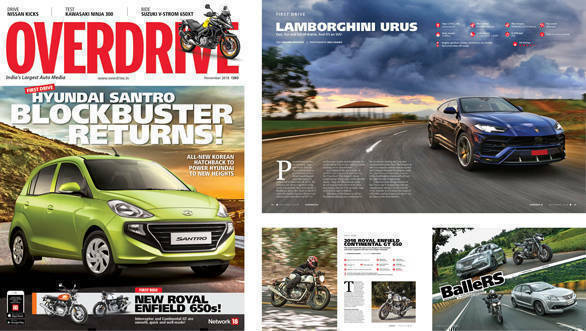 Don't forget to read our feature about the Baleno RS and the Street Triple RS. We take part in the Royal Classic Drive to Mysore and also ride TVS Apache models in Sri Lanka as the company celebrates three million sales of the Apache brand. That's not all, our Editor the motorcycle man comes away impressed by the proposition of a track-focussed Volkswagen Vento TC4-A after driving it around the Buddh International Circuit (BIC) in Noida for a day. There is also news from MotoGP Thailand, and Formula 1. But there's more. To read about all this and others, go and pick up the latest issue of OVERDRIVE, now.